"...story is internal, not external. A story is not about the plot, which is why external story-structure models, including the over-revered Hero’s Journey, often lead writers far astray. A story is about how the plot affects the protagonist." This story for 11 to 14-year-olds is about a kid with a big problem: everyone who has died in his family has died by being struck by lightning. Newton’s family history makes it difficult for him to have a normal life, and he doesn’t have many friends. He’s an interesting character with a few quirks, such as an interest in cooking truffles, a pet pig and a father who lives in a concrete dome. In this story, Newton is at a special school to learn some survival skills in the hopes that he will be able to have a more normal life. 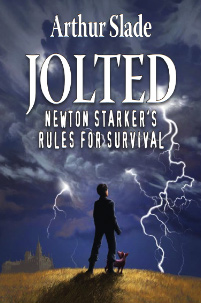 There’s a lot of humour in this story as well as some touching moments as Newton gains new friendships, comes to terms with his mother’s death, and copes with his weather-related problems. As a writer, this book gives me a great example of how to create an interesting character. I found this book at my local library and I liked the title. Arthur Slade is a full-time writer living in Saskatoon in Saskatchewan, Canada. Second Fiddle was chosen as an Indy Next Pick in the spring of 2011. I previously posted on another of his novels, The HunchbackAssignments. The tone and subject of this one is very different, but I enjoyed them both. Island of Doom: The Hunchback Assignments IV. HarperCollins, 2012. For more, visit Arthur Slade’s website. I hear a lot of advice about not sending manuscripts out before they are ready, and not being impatient. I try not to do that. But I think that sometimes I just didn't have enough knowledge and experience to know that some of those manuscripts I sent out weren't ready. I get lots of feedback from my critique group and beta readers. And I let my manuscripts "rest" for weeks, sometimes months, and go over each word again before I decide I'm ready to submit them. They always seem pretty good to me, until the rejection letters start flowing in. But after the hard work I put into my latest revision, I now know that there's another level to aim for. I'm not sure how to describe it, but this time my story feels different. 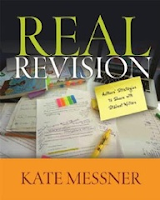 I think the reason is that I set out to revise with specific goals in mind, and I made deliberate decisions and choices for the good of the story. As a result, it feels like the story is somehow more "complete" even though it was a completed story before I started. Have you ever felt that you've taken your story to an entirely new level? What strategies did you use to get there? If you know this book, you may know that it’s a picture book, and not technically targeted for readers of middle grade books. But since International Dot Day was on September 15th and this is a book that can be enjoyed by readers of all ages, I decided to feature it today. Plus, it’s one of my favourites! my notebook is my space where I'm free to make whatever kinds of marks I want -- lines, doodles, drawings, words, stories...whatever! 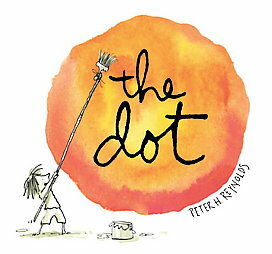 Did you draw a dot today? and then plunging them into ice water. But what the kids really like to do is to pick the green tomatoes or collect rotten ones and squish them up for "potions class". It's cool to take an ordinary object and think about the different perspectives people of different ages might have about it. After all this thinking, I considered writing a quick story about a girl who has a big tomato problem. But first I have to go make some salsa. With revisions completed, I'm planning to start querying Novel #4 again soon. But before that can happen, I need to create "the package" - which includes a synopsis. I HATE writing the synopsis. For me, it's worse than writing the query letter. How To Write A 1-Page Synopsis by Susan Dennard, over at Pub(Lishing) Crawl. Which do you find harder: writing the query or writing the synopsis? Any good resources to share? I can only imagine what my daughter thought when she came home from school and saw the countertop scattered with potatoes, tiny party hats and speech bubbles, because of course I had my brilliant idea for the MiG blogpost right before I had to leave for work. But then again, since I write children's books, my kids are used to some of my crazy ideas and the sometimes weird things I end up doing to test them out. I don't think you'll be seeing any spud stories from me in the near future. But it was fun to play around with them. It reminded me how a tiny spark can grow into a bigger idea. 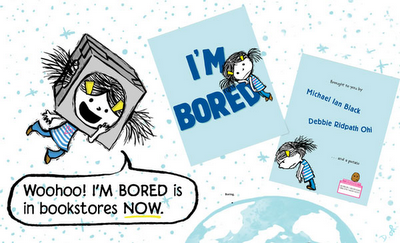 Yesterday was the release day for illustrator (and my critique buddy) Debbie Ridpath Ohi's picture book I'm Bored, written by Michael Ian Black. 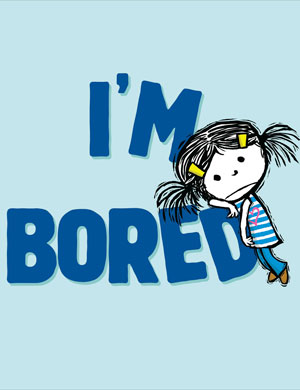 To celebrate the release of I'm Bored, the MiG writers are posting all week on something related to being bored or potatoes! Commenting on one (or all) of our posts gives you chances to win your very own copy! Tweeting also gets you extra entries. This is a lovely story about a girl and how she fits into her family when a life-changing tragedy strikes. I got hooked right from the first page. Livie was a living, breathing person in my mind and I felt all her sadnesses and worries right along with her until the end of the story. I could relate to Livie as a tomboy and her struggle to be who she wanted when it seemed like other people wanted her to be someone else. The details about the bayou setting, complete with gators and bullfrogs, made the story lively and interesting. I often hear writing advice about making sure every word counts, and in this story they all truly did. Each phrase or sentence includes details that capture Livie’s thoughts and voice. 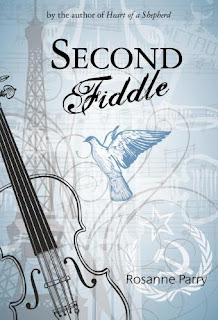 I’d read this again to study how Kimberley Griffith’s Little fit all the pieces together to make the story come together so perfectly and to learn more about showing story events from the main character’s perspective. Kimberley Griffiths Little knew she wanted to be a writer in elementary school, when she used to write stories every day and read lots of books. She lives with her husband and children in a solar adobe house in New Mexico. Her next middle grade book, When The Butterflies Came, will be published in April 2013. 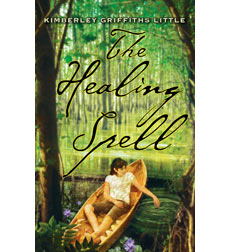 The Healing Spell won the Whitney Award for Best Youth Novel of 2010 and was chosen as a Bank Street College Best Book for 2011. For more, visit Kimberley Griffiths Little’s website.